Frontline did a sterling job of showing how public health officials have been dealing with outbreaks at Foster Farms for ten years. But the one thing the show didn't mention was that this chicken factory carries the seal of approval of the American Humane Association, which calls the company "the most trusted brand of poultry in the Western United States." 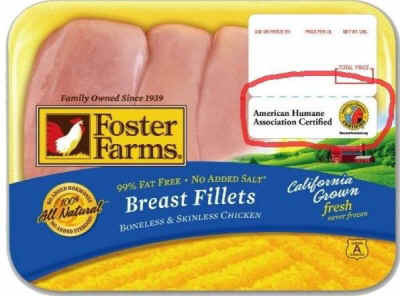 Foster Farms promotes itself as being "proud to offer locally raised and American Humane Certified fresh and natural, simply raised without antibiotics, and organic fresh chicken." This "most trusted brand of poultry" had its first tussle with food inspectors in 2004, when safety officials were trying to get to the bottom of an outbreak of a particularly dangerous strain of salmonella: salmonella Heidelberg. Foster Farms obstructed the investigation, but it eventually emerged, according to Frontline, that "Foster Farms was responsible for an outbreak that sickened 46 and killed 1." In 2012, there was a second outbreak. This one went on for a year and sickened more than 600 people. Dr. David Goldman, assistant administrator of the USDA's Food Safety and Inspection Service, said: "When we sampled the Foster Farms plants, in three of them we found roughly 25 percent of chicken parts, maybe slightly higher, had salmonella." Every year, salmonella causes more hospitalizations and deaths than any other foodborne illness. This common bacteria has become one of the top food safety issues in the U.S., and it’s often found on the meat most popular with Americans: chicken. In fact, about one in four pieces of raw chicken is contaminated with Salmonella today. Between 1998 and 2012, chicken and turkey have been associated with 278 salmonella outbreaks in at least 41 states. And that’s just the tip of the iceberg, since most cases go unreported or unsolved. We've discussed the American Humane Association in earlier posts – like when it gave its seal of approval to Butterball. This was less than a year after Mercy for Animals had released video showing employees kicking and stomping turkeys at the company's plant in North Carolina, prompting a raid by local officials. "We're delighted Butterball shares our passion for humane care," said AHA President Dr. Robin Ganzert. Several other animal welfare organizations, including the Humane Society of the Untied States, offer certification programs. They're all highly suspect. Bottom line: If you're still buying animal products, you're not only supporting animal abuse; you're endangering yourself.